The choice of haircare products is so huge that you should pay special attention to the ingredients they contain. One of the popular added ingredients are the various types of oils. They can significantly enrich the product, but you often do not know how they benefit your hair and whether they actually work. Let’s have a closer look at the three oils that Cameleo experts chose for the Beauty Balm for Hair series. Coconut, jojoba and almond oils are the most popular ones, but there are others, equally beneficial. Anyone can reach for oil-enriched products, but they are specially recommended for the owners of dry, damaged and weak hair. If you have oily hair, you can use oils on the hair ends which are very prone to drying and splitting. Oils prevent the evaporation of water by creating a protective layer around the hair, moisturizing, softening and adding shine. But not only that! 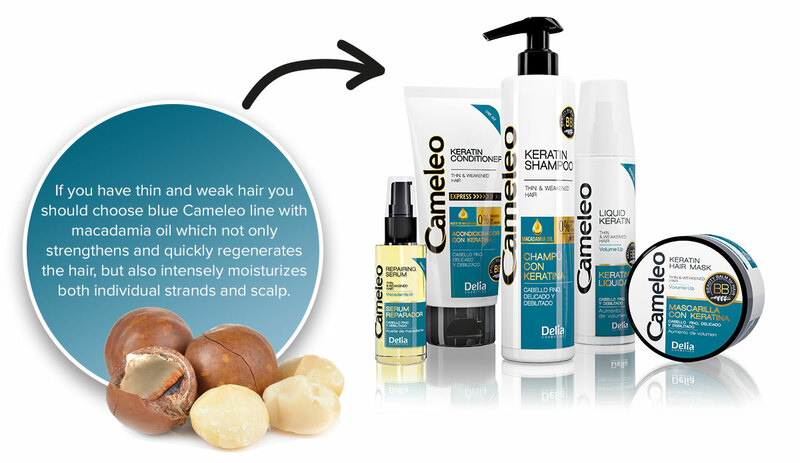 Learn why Cameleo experts chose them! Obtained from the fruit of the Moroccan argan tree (hence the common name “liquid gold of Morocco”), argan oil has long been ruling on the cosmetic market. But do you know all about it? Argan oil is rich in unsaturated fatty acids, vitamin E, and nutrients such as carotenoids, polyphenols and phytosterols which are antioxidants. Thanks to them your hair becomes extremely shiny and soft as silk. In addition, argan oil strengthens and regenerates the hair. But its most valuable property is that it is suitable for all hair types! It makes unruly strands more disciplined, regardless of whether you have hair straight or wavy! It works perfectly well with spiral curls, because it doesn’t straighten them unlike many similar ingredients that make the hair resistant to styling. 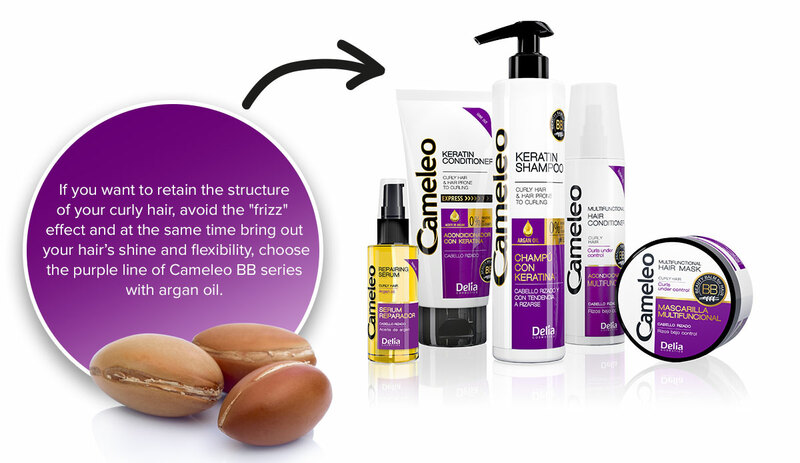 So if you want to retain the structure of your curly hair, avoid the “frizz” effect and at the same time bring out your hair’s shine and flexibility, the purple line of Cameleo BB series with argan oil is perfect for you! Macadamia nuts gathered from the trees discovered in Australia and Africa, have an extraordinary regenerating power due to vitamins A, E (called vitamins of youth) and B, and minerals. That’s why the oil extracted from them is perfect for fine, dry and weak hair. It not only strengthens and quickly regenerates the hair, but also intensely moisturizes both individual strands and scalp. Macadamia oil also provides heat protection against the harmful effects of dryer or straightener and accelerates hair drying. Smoothing properties of macadamia oil ensure amazing shine and elasticity, which is characteristic of healthy and strong hair. 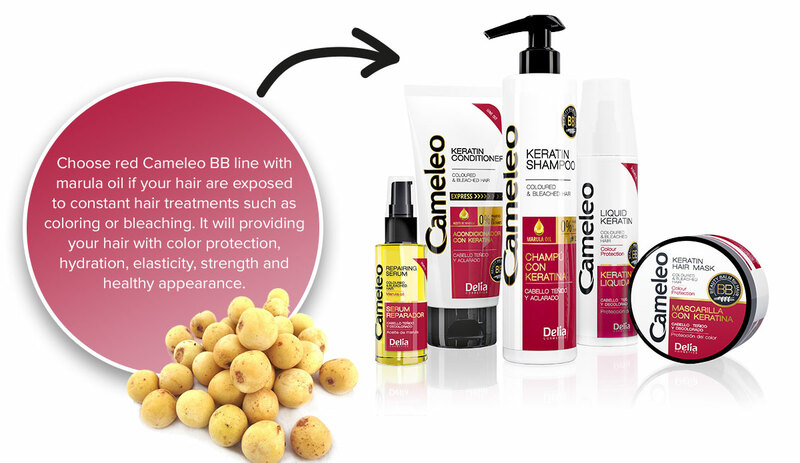 So if you want to give your hair strength and vitality, reach for the line of Cameleo BB series for thin and weak hair. Until recently, marula oil has been known mainly as a basic ingredient of the famous African liqueur, Amarula, made from the fruits of the marula tree. Now it keeps appearing on the cosmetic market in the form of a cold-pressed oil extracted from the kernels of the marula tree fruits. It is rich in unsaturated fatty acids and proteins. But what does it mean for your hair? Thanks to a wealth of nutrients, marula oil supports the reconstruction of damaged hair, accelerating its regeneration. It also has a beneficial effect on your scalp, strengthening its lipid barrier, improving hydration, and thus helping to minimize the unpleasant dryness and itching. These properties of marula oil are extremely important for the hair that are exposed to constant hair treatments such as coloring or bleaching, which often cause over-drying and weakening. Such hair is also more prone to color fading caused by weather conditions. That’s why it is marula oil that enriches the Cameleo shampoo and conditioner for colored and bleached hair, providing your hair with color protection, hydration, elasticity, strength and healthy appearance. Be sure to choose the ingredients according to the type and individual needs of your hair, and when you already have the right product, use it regularly to achieve the desired effects. Here’s the recipe for a healthier and more beautiful hair-look! Is it not what every woman wants for her hair?